Selecting the best eCommerce platform for creating, managing and maintaining an online store is an important factor which will determine the success or failure of your business. MagePlus is a hosted solution which will help you to start your eCommerce website in just one day. With MagePlus you will get the power of Magento eCommerce platform and Aspiration Cloud Hosting. 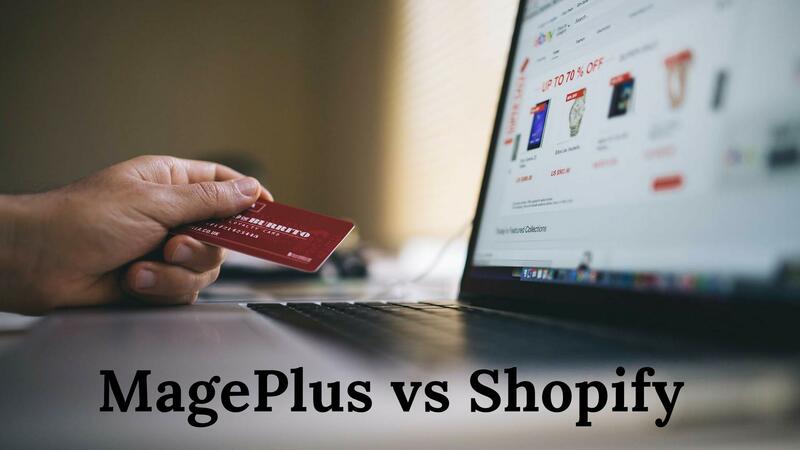 Our comparison of MagePlus vs Shopify will highlight their differences and help you decide which is the best platform for you. MagePlus vs Shopify: which should you choose? Because Shopify themes are proprietary, they don’t allow for a lot of customization. All you can do is change the color, font and some other things. Since Mageplus is based on Magento, which is an opensource, you have thousands of themes which can be configured as you like it. You can customize your storefront to meet your branding requirements. And also the drag and drop website builder of Magento 2 will help the noncoders to create their beautiful store in no time. About half of the online purchase begin with an online search. Therefore it is very important to make your site SEO friendly. In a study done by eCommerce-platforms among shopping cart platforms, it is found that Magento is the best SEO optimized eCommerce platform. By using the Magento based MagePlus, you can ensure that your site will be SEO friendly. According to kissmetrics a delay of 1 second to load your website can reduce the conversion rate by 7%. MagePlus is running on cloud SSD drives which is the fastest storage medium available till date. MagePlus is coming up with Aspiration CDN will make sure that your site is loading faster anywhere in the world. With LiteSpeed server of Aspiration Hosting and Magento 2, MagePlus is much faster than Shopify. A quick and user-friendly checkout is another feature that is differentiating Magento over Shopify. Magento 2 have easy, distraction-free checkouts which will help to reduce cart abandonment rate. A major drawback of Shopify is that they cannot see real-time shipping rates. The main feature of MagePlus is that you can launch your eCommerce website in just one day. Just select the plan you need, our techs will install Magento and configure the store for you. Since thousands of extensions are already available in the Magento store, you can add any functionality you need to the store without knowing any coding. When you can compare the features and cost of both Shopify and MagePlus you can find out that MagePlus is providing more features than Shopify with the same pricing. MagePlus is offering unlimited staff accounts, unlimited gift certificates etc.. with all the plans compared to Shopify. With MagePlus plan, you can create your store without knowing any coding. Just select the plan and our techs will install and configure the site in one day.